The Lower Mills branch is closed through mid-summer. 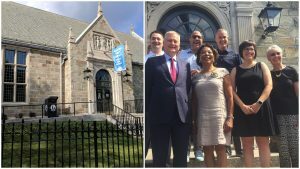 City and State officials, along with residents and library staff, celebrated the reopening of the Parker Hill Branch of the Boston Public Library at a community celebration on Saturday, July 28. The celebration marked the end of a yearlong closure for interior and exterior repairs and improvements. The $2.4 million investment, part of Mayor Martin J. Walsh’s capital budget, included significant repairs to the façade, waterproofing and plasterwork, historic window replacements, and interior painting. The project is a collaboration between the Boston Public Library and the City of Boston’s Public Facilities Department, with assistance from project architect Bargmann Hendrie + Archetype (BH+A) and construction firm WCI Corporation. "Libraries are places that knit our communities together and reflect the qualities of their neighborhood; I’m proud that through this $2.4 million infrastructure investment in the Parker Hill Library, patrons can once again utilize its important resources and services for years to come,” said Mayor Martin J. Walsh. More details can be found about the programming schedule for the Parker Hill Branch, which includes a variety of summer reading activities, on the BPL’s Parker Hill Branch dedicated web page. Public service hours will be the same as prior to closure: Monday through Wednesday, 10 a.m. – 6 p.m., Thursday, 12 -8 p.m., Friday, 9 a.m. – 5 p.m., and Saturday, 9 a.m. – 2 p.m. Located at 1497 Tremont Street in the Mission Hill neighborhood, the Jacobean-style branch building was designed in 1929 by famed architect Ralph Adams Cram, and opened in May 1931. The branch serves Mission Hill residents, students and workers, neighborhood schools, youth programs, and collaborates with community organizations. Branch programming includes author talks, story times, exhibitions, book discussions, exercise classes, and more. Through the Imagine Boston planning initiative, Mayor Martin J. Walsh is investing $128 million in funding for library projects slated for FY19-FY23. Capital investments will be used to preserve existing buildings and to create new library spaces to improve services. More information on projects can be viewed via https://www.bpl.org/about-us/finances-budget/capitalprojects/. Boston Public Library provides educational, cultural and civic enrichment, free to all, for the residents of Boston, Massachusetts and beyond, through its collections, services, programs, and spaces. Established in 1848, the Boston Public Library is a pioneer of public library service in America. It was the first large free municipal library in the United States, the first public library to lend books, the first to have a branch library, and the first to have a children’s room. As a City of Boston historic cultural institution, Boston Public Library today features a Central Library, twenty-five branches, a map center, business library, and archival center along with its extensive special collections of rare books, manuscripts, photographs, and prints and rich digital content and online services. The award-winning renovation of the Central Library in Copley Square, completed in 2016, together with new, renovated and historic branches, provides a transformed library for the next generation of users. Boston Public Library enriches lives, hosting thousands of free educational programs and exhibitions, and provides free library services online and in-person to millions of people each year. To learn more, visit bpl.org.